Today I'm sharing my 2014 Project Life title page with you. I've found that there are a few groups on Facebook for Project Life and Digital Project Life that provide an amazing level of support and inspiration. In our little digital Project Life group, we decided to create a blog circle to show off our layouts. I'm excited to work with this group of talented Project Lifers, and today we are all introducing ourselves. Please make sure to visit everyone in the circle and get to know us! You should be visiting me from Lyn's blog, Robot Days. If you are new to my blog, you can find out a little about me here. If you're new to Project Life, check out my past posts here. I've been a Project Lifer for almost 3 years now. Totally love this style of scrapbooking, but last year grew a little overwhelmed with keeping up with the paper format. I don't like to do things completely simple (even though that is the whole goal of Project Life), so I found myself in a struggle with getting my pages perfect. That's why I chose the digital Project Life route for 2014. With digital, I can keep my page as a layered file until it's done, without having to leave out an album and supplies. I can also create or buy elements as I want them, which gives me a lot more flexibility. I am also not sticking to a strict weekly or monthly format for 2014. My plan is to add photos and journaling in chronological order, not worrying about what dates fall within each layout. I will keep each double page layout coordinated though, but that really is personal preference. So whether two pages span a day or two and a half weeks, I'm not going to worry about that! 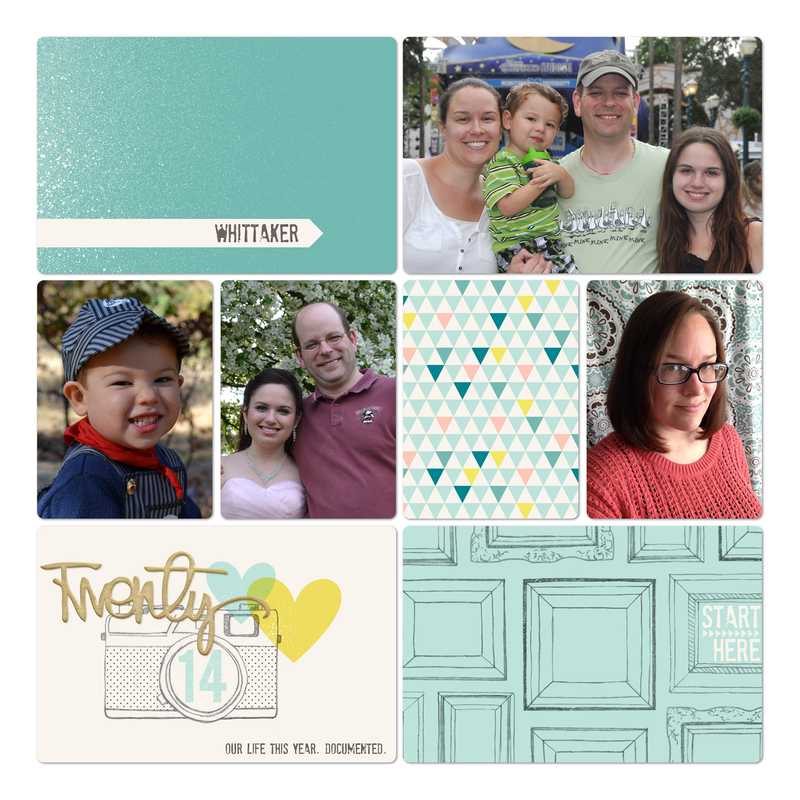 I used cards from the Polka Dot Party digital mini kit, mixed with photos of our family. The card in the upper left features a little dog along the side, so I just enlarged the card enough to remove him from the page. I added some text over on the bottom right saying "start here", and some arrows from Deena Rutter's Count On Me brush set from Pixels & Company. Open the cut file in Silhouette Studio. Fill it and the cut lines with black. Zoom in so you get the image on your screen as large as it can be where you can still see the entire image. Take a screenshot. On my Mac, I use command, shift, and the 4 key all at the same time. Then you get a little cross mark and you can select the area you want to capture. It automatically saves it to your desktop. Bring the image into Photoshop/Elements, and use the background eraser to erase the background. Now you can save it as a PNG file, and use it as you like. I applied a layer style to make it appear like a wood veneer element. Then I added a very slight shadow to it. After adding the veneer element, I added the '14' with a layer style applied so it appears a bit distressed, similar to the hearts on the card. Finally, I typed in our last name at the top of the page and "Our life this year. Documented" at the bottom. I am using templates from Cathy Zielske which you can find here on Designer Digitals. I love the subtle rounded corners and shadows. So there you have it, the start of my 2014 Digital Project Life album. I'd love it if you'd hop on over to Anika's blog next and check out her own introduction to 2014 Project Life. Lovely title page! I like your idea of not sticking to a strict weekly/monthly format. I may have to revert to that if I get behind, which is quite possible. We have, I think, the same plan for the weekly/monthly format. I plan to work on it weekly and if a double page spread is a week, great. If not, great. I love how you enlarged that title card! Great use of this adorable kit (The hoarder in me craves it...). I also have a similiar plan on the format, this is to minimize pressure. I really see the benefits of going digital. How do plan to handle ticket stubs, etc. I know you can scan them, but will you keep the originals? I will. I'll probably use the envelope pages and hang on to them that way. I just hate tossing memorabilia. Very nice page there and thank you for sharing the tip on Silhouette files, must try that. Wow, I love how this looks! I can't wait to see how the whole album will look when it's all printed. Did you decide on what size you're going to print it? I think I might do some quarterly books for Austin (well, for me, then for him when I print the full year). Those 8x8, but I think maybe 12 x 12 for the full year. I worried that an 8x8 will be too small, not sure. You already know this, but I love this new format and your 2014 layout. :) Thanks for inviting me to that FB group, by the way, it's super handy! I don't think so, no, kinda have to click all the links to see everyone I guess! Love your title page. Thanks for sharing that little tidbit about the Silhouette files. can't wait to try it out myself. Cheers! Hi there! I was literally just goggling how to make a silhouette shape into a PNG file to use in Photoshop and waa-laa - you did it! When I goggled it believe it or not I got nothing! so I was so pleasantly and ironically surprised to see this on your blog! I understand the potential for abuse and agree that if done, should be for personal use only. Thank you for sharing the info! i love your page. this is my first attempt at DPL or even PL for that matter. i was worried about how I would do with keeping up every week and what if i had 25 pictures that i wanted to scrap of a single event. your post has helped curb that worry for me. thank you for sharing your page and your tips. Can't wait for the rest of the year and your layouts Melissa!